I just love homemade veggie burgers. 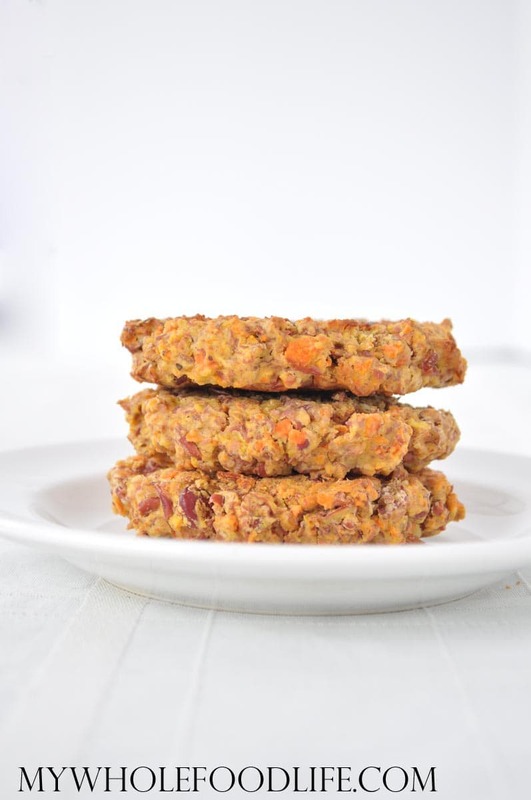 These Curry Kidney Bean Veggie Burgers are the latest recipe. This recipe was inspired by my curried kidney beans and corn recipe. It’s hard to make these Curry Kidney Bean Veggie Burgers look good in a photo, but I promise you they are delicious! These veggie burgers are great on their own, or you can eat them on a bun. I personally skip the bun and eat a couple patties with some veganaise. I also serve them with a side of roasted vegetables. So good! 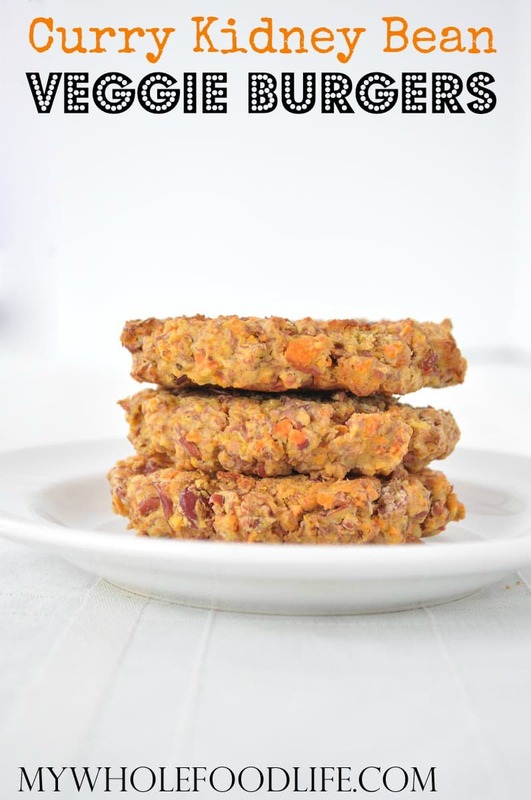 These healthy veggie burgers are vegan and gluten free. I also used almond flour instead of oat flour, so they are grain free too! 🙂 If you didn’t want to use almond flour, oat flour would also work well. I think spelt flour would too. In a food processor , pulse the kidney beans a few times to break them down being careful to not fully puree them. Remove and put in a bowl . Next, put the carrots, onion, and garlic in the food processor and pulse until finely diced. Add to the bowl with the kidney beans. Add the rest of the ingredients in the bowl and mix well. Form into quarter-cup sized patties on a pan and bake for 1 hr, flipping them about half way through. Remove and let cool. I needed two pans to use the entire mixture. It made about 15 patties. Melissa, these look phenomenal! Since I live alone I could go ahead and make half this recipe correct? Also when you put your carrots and onions in the food processor do you cut the carrots into chunks or do you shred them first? Was concerned that the processor wouldn't be able to handle cutting the carrots finely enough. So happy these are grain free and it includes my two favorite spices of curry and cumin! YUM! Thanks Heidi! I think you probably could half the recipe. If you wanted to do the full batch, you can definitely freeze some too. I cut the carrots into smaller pieces and threw them in the food processor. If your food processor is not very powerful, you can shred them instead. Good to know that i can freeze them! I love making bigger batches of meals and then freezing them for later :) My food processor is a good one so I might try your method first. Thank you so much for all you do on the website and on the Facebook Page. You have been such a blessing in my life and I have learned to enjoy food regardless of my eating limitations. You are so welcome Heidi! I hope you enjoy the burgers! Thanks again Melissa! So nice to have a delicious idea for tonight's dinner now! These look amazing! If using baby carrots, how many would you think? Thanks! If I had to guess, maybe 2 cups baby carrots? Hi Melissa - I am not a big fan of kidney beans and I am sure the beans can easily be swapped out for other beans. I am wondering though about your thoughts on lentils. I am thinking first of trying with Adzuki beans. Hi Melissa, These looks very tasty! Can another spices be swapped for curry powder? I do not currently have any and am wondering if Garam Masala could be substituted, and if any other adjustments needs to be made? That might work? I am not 100% sure though. can i substitute flour instead of almond flour? why dont you ever post nutritional info ? I am not a nutritionist and I don't weigh my food, so my calculations would never be accurate. I would hate to be wrong in the case of a diabetic. You can plug recipes into www.caloriecount.com for rough estimates.